Boston Children’s Museum announced that major sponsors have signed on for the second annual Boston Mini Maker Faire event on Sunday, September 17, 2017. The Museum, in collaboration with Maker Media, WBZ-TV/CBS Boston, Boston Public Schools, the City of Boston, welcome sponsors Autodesk, BOSEbuild, MathWorks, National Grid, PEAK Event Services, Skyworks Solutions Inc., Ultimaker, Velcro Companies, Vertex and Senator William "Mo" Cowan and Mrs. Stacy L. Cowan, who have all come together to make the Boston Mini Maker Faire possible. 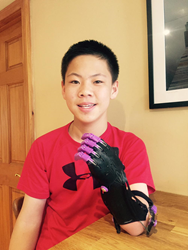 A diverse group of “Makers,” from robotics groups like New England R2 Builders and iRobot; to cutting edge technology companies such as Formlabs; to local maker spaces like Boston Makers, and inspiring junior makers like Sam Hoyt, a 13-year old who 3d-printed his own prosthetic arm, will share their ingenuity with the thousands of attendees to the Maker Faire. The Boston Mini Maker Faire is being led by Boston Children's Museum and an advisory board of leaders from local maker organizations, including: Emily Glaser of Boston Makers, Haidan Hodgson from Artists for Humanity, Henry Houh from Einstein's Workshop, Netia McCray of Mbadika, Amon Milner from Olin College, Abigail Norman from Eliot School of Fine & Applied Arts, Derek Seabury from Artisan's Asylum, and Rosa Weinberg from NuVu Studio.